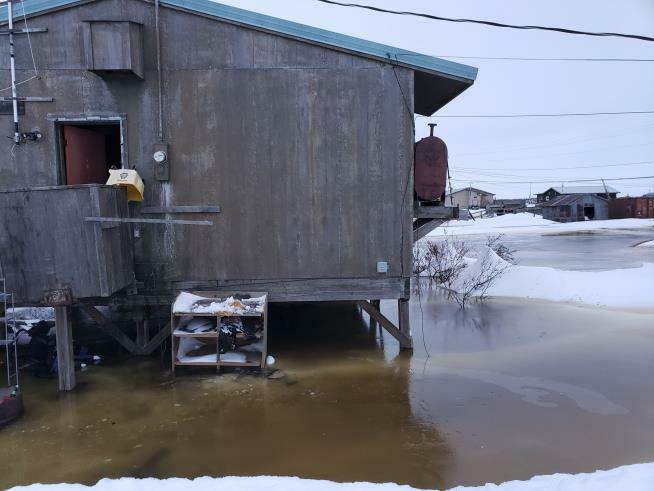 (Newser) – The Yupik Eskimo village of Kotlik on Alaska's northwest coast relies on a cold, hard blanket of sea ice to protect homes from vicious winter Bering Sea storms. The ice normally prevents waves from forming and locks onto beaches, walling off villages. But not this year. In February, southwest winds brought warm air and turned thin sea ice into "snow cone ice" that melted or blew off. When a storm pounded Norton Sound, water on Feb. 12 surged up the Yukon River and into Kotlik, flooding low-lying homes, the AP reports. Lifelong resident Philomena Keyes, 37, awoke to knee-deep water outside her house. "This is the first I experienced in my life, a flood that happened in the winter, in February," Keyes says. Rapid, profound changes tied to high atmospheric temperatures, a direct result of climate change, may be reordering the Bering Strait's physical makeup. Ocean researchers are asking themselves if they're witnessing the transformation of an ecosystem. The Bering Sea last winter saw record-low sea ice. Climate models predicted less ice, but not this soon, says oceanographer Seth Danielson. "The projections were saying we would've hit situations similar to what we saw last year, but not for another 40 or 50 years," he says. The diminishing sea ice is expected to affect wildlife and sea life, and limit villagers ability to hunt. It's too soon to blame it all on climate change, says oceanographer Phyllis Stabeno, but it is concerning. "We're in winter," she says. "This is all supposed to be frozen." 25,000 years ago the Climate was different.. Much Colder.. SO COLD.. the Bering Sea was 100% frozen and man walked across. We have Been Continuously Non Stop Warming for the past 30,000 Years.. 29,850 years Without ANY significant Man Made Influence. 80,000 Years ago the Climate was Much Different Warmer We had just peeked in the previous warming period,, And then the Temp Plunged into a Glacier Ice Age period. The One we are Warming from TODAY.. 10,000 Years form now...The Climate will be Different... The Surprising thing is.. We should theoretically be into our next (Freezing our A55 Off) Galactic Period. Pretending we can make the Climate NOT Change or Engineer it to Change the way we WANT it to Change Is Idiotic..
Yea people the earth & weather do some crazy shite... Lets all panic now.